This is a reliable surprisingly bright and compact solar rechargeable light that will easily fit in your Bug-Out Bag and is great for camping, during a power outage, or for everyday use as a flashlight replacement. In a Doomsday survival or camping scenario, having light at night (especially if it is pitch black) is essential when you are not trying to stay hidden. For camping, several of these solar rechargeable lights will provide light as well or better than a more expensive gas lantern without having the extra weight of a heavier gas lantern and fuel. 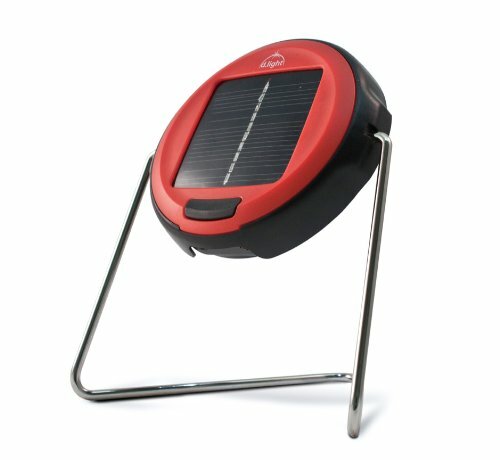 Over time, all of the added weight, cost, and ability to obtain and carry fuel make this solar rechargeable light (even several of these) lighter to carry and much less expensive to operate compared to a gas lantern. The d.light LED Solar Rechargeable #S2 Task Light will charge in indirect light. It has more than a 5-year lifetime and no battery replacement is needed. The light disk is roughly 3.5" to 4" in diameter and sits approximately 5" high on the stand. It takes approximately 6 to 8 hours to fully charge. This light is rated to last for 4 hours with only one mode. During testing, on a full charge it will provide light for approximately 4 hours before the light intensity begins to drop. Light intensity drops off at a faster rate after 5 hours, but even after 7.5 hours it is still putting out usable light. If you have several of these solar lights, since there is an on-off button, you can turn another light on when one begins to fade out. This solar light has an adjustable handle that can be detached, carried, hung or placed on any surface. We have these in our Bug Out bags, in all of our vehicles, and several more in our home. These are one of the best preps we have. We use these for camp site lighting, for emergency and every day use instead of flashlights. The light on this particular solar light is more directional than it's companion light, the #S20 Area Lantern (see link below). Also, the #S300 Solar Rechargeable Lantern and Cell Phone charger is a robust floodlight with a separate solar panel that can also charge GPS and Smartphone devices. The S300 can also be charged from a USB connection in addition to solar charging. The d.light LED Solar Rechargeable #S2 Task Light ranks #3 in our Top Ten Best Portable Solar Panels & Solar-Powered Products list. The following YouTube video is a good review of all dLight model solar lights including the d.light LED Solar Rechargeable #S2 Task Light. "You CANNOT go wrong with these little guys. They weigh nothing, they kick off a good, bright focused light, hence, the name Task light. It's perfect. I have three and will most definitely buy more. I tell everyone about them...."
"These lights are fantastic. They put out a decent light that you can read by. You can hang them on things or set them down on a flat surface. They don't take long to charge. AND they don't cost much. I bought a couple of them and liked them so much that I bought five more for myself and three more for a friend. And I still like them so much that I'm thinking of buying some more - I don't know why since I've already got so many. But when something provides such a great value, I just feel like I can't resist!" "Outstanding Solar Rechargeable Light! This light is fantastic! It recharges in just partial sunlight and is super light and small, but yet puts out bright lighting. I like that it has a small red light to let you know when it is recharging." "Love these and plan to buy a couple of more. They are very well constructed and will shine all night on a charge." "These are terrific! I got them for everyone for Christmas a couple years ago, and two for me. I keep them near a sunny window so they are always charged. Work great to have a light on in your house when you are away as well as for camping. Sturdy and light, but nice bright light. Everyone should have these for power outages." "I'm very happy with this light. Smaller than expected which is a bonus. If left in my south facing window during the day, mine runs for around 8 hours. Got it as a self sustaining light source for extended backpacking trips, but have found it very handy around the house during power outages. The stand is actually a great design. Hang it on doorknobs, cabinet handles, etc. You can rotate the light up or down so it's not shining in your face. You can also take the stand off and attach a lanyard or length of cord to hang it by....."
"Super Nice! Wonderful light. Great for camping and indoors alike. Our young children have adopted this light as their reading lights as it's quite bright and no heat. Then for camping, they do as well as a gas lantern (ok, not as bright but for the price, just get multiple ). I love the fact it charges in indirect light which is a plus for areas with lot's of trees." "A must have for powerless situations. I bought this with the intention of keeping it on hand for loss of power lighting needs. My children have taken it over though. It makes a nice light for the older child to read in her bunk at night, while the younger one sleeps. It is a nice size to carry around and very light due to the lack of bulky batteries. It will easily light up a bedroom bright enough to make the children comfortable in a power outage situation. My oldest son took it camping this weekend and will be using it in the tent for extra light. I have not used it 4 hours straight yet, but I don't see that amount of time being a problem. Great buy, just ordered the S20 and hope I will be just as happy!" d.light LED Solar Rechargeable #S20 Area Lantern (The S20 model throws out light in more of an area (compared to the model S2 above which is more of a directional task light), and has a low mode (8-hour run time) and a high mode (4-hour run time) on a full charge. This model will hold its charge up to one year). d.light LED Solar Rechargeable #S300 Lantern and Cell Phone Charger (The S300 Solar Rechargeable Lantern and Cell Phone charger provides a bright flood of white light, enabling the illumination of an entire room. The dlight S300 features four brightness settings, nightlight (100 hours), low (16 hours), mid (8 hours), and high (4 hours). A USB port provides the ability to charge smartphones and a battery indicator shows the charge level).